Daiwa moves a step up from their Sealine (X) line of conventional reels by offering anglers the Seagate series. Built tougher and with a stronger gear train, the Daiwa Seagate steps up with added features as well. The Seagate uses Helical cut gears which increase strength and smoothness in the drive. 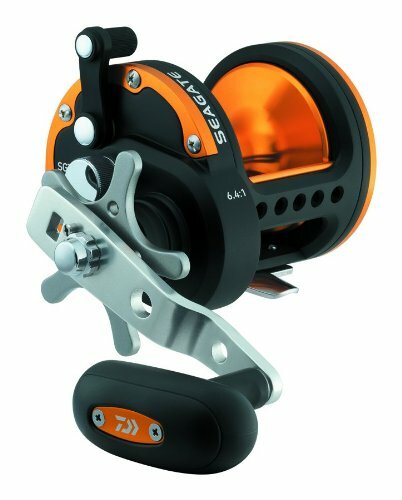 Other examples of additional features include Daiwa’s Ultimate Tournament Carbon Drag system and Centrifugal Spool Brake. 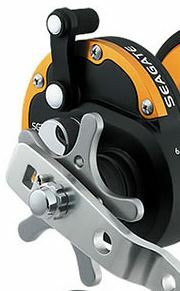 Product: The Daiwa Seagate SGTH Series Conventional Reel. The Daiwa Seagate keeps cost and weight down with an anti corrosive graphite frame. It can be identified by an orange colored aluminum spool and orange trim on the side plate. Though I’ve often suggested such reels as Daiwa’s own Sealine X or the Penn Squall to beginners, the Seagate makes casting even easier. It easily joins this group of reels. The centrifugal spool brake helps keep the spool from spinning faster than the release of line, a great aid to anglers learning how to cast. Every offshore fisherman knows the frustration of bird nested line in a frozen spool. The Seagate spins on a simple 4 bearing system that includes 3 anti corrosive bearings and 1 anti reverse bearing. Daiwa builds the Seagate in five different models ranging from a 20 size reel and reaching up to a 50 model. Prices follow the reel sizes as they increase since more material does add up on the manufacturing side. These are the model numbers as they are listed. 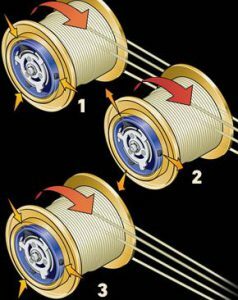 Seagate reels contain 2 constants between all reel models; the features remain the same as does the 4 bearing system. Daiwa kept the weight down when designing the Seagate and the line starts at 14.3 ounces in the smallest SGT20H model. The largest SGT50H puts 21.9 ounces in your hand. The Ultimate Tournament Drag provides better resistance than Sealine X reels. Max drag starts at a powerful 15.4 pounds in the 20 model and reaches up to 19.8 pounds in the 50. Daiwa Seagate reels spin quickly with gear ratios ranging from 6.1:1 to 6.4:1. The SGT20H holds 420 yards of 12 pound mono line and the 50 model wraps 220 yards of 50 pound mono. I’ve named a few Seagate features already. 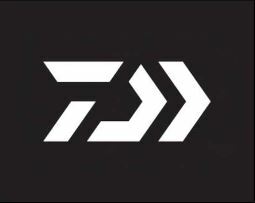 Those brand specific and often patented designs of technology that every angler wants to investigate. And for good reason. Often times those features make a big difference on the water. Take a look at what the Seagate offers in more detail. CRBB stands for corrosive resistant ball bearings and they’re worth mentioning for having even better anti corrosive properties than regular stainless steel bearings. The bearing system includes 1 anti reverse roller bearing which I’ll discuss next. I’m looking for clarification on this point though the value of an AR bearing that instantly stops the spool becomes easily apparent. I assume a dual system means the Daiwa Seagate employs both the AR bearing and a dog in the anti reverse system. It would definitely be good to know and I’ll clarify once I find out. 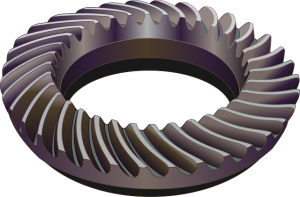 Those who don’t know helical gears (like myself before I looked it up) would likely recognize them by their curved grooves. When helical cut gears come together they hit at the top most point then work their down the curved alley. They never lose contact with each other at any point along the groove as they turn. The Daiwa Seagate has the same UTD system as the Saltist line of reels and has been drastically improved upon from the older drag system. The reason starts with the drag discs which feature high density woven carbon fibers. Furthermore, the hard fiber discs go through an oil impregnation process which keeps them constantly lubricated. I mentioned the casting advantages contained in reel with a centrifugal spool brake. Every angler started learning the baitcaster at some point and we all know the frustration of blowing a spool up into a hundred knots. The centrifugal brake uses blocks that touch and add friction against the spool as it’s cast. The block pressure increases the faster the spool spins which controls but also can limit the range of the cast. The anodization process gives the spool that smooth polished finish and it also makes the aluminum incredibly anti corrosive. Anodized aluminum makes up the spool on most reels though it becomes very important in saltwater fishing. Finishing touches include a stainless steel star drag secured by a cranking style handle, also made of stainless steel. Underneath the star drag lever sits the control knob for the spool brake and above that rests the bail switch. Seagate design placed all control settings within easy reach of each other allowing fishermen quick adjustment. The Daiwa Seagate offers good value because of performance and price point. Graphite composite material used in the frame prevents corrosion and keeps the overall weight of the reel down. Fishermen looking to learn baitcasting techniques will enjoy the centrifugal spool brake and have fewer episodes of backlash. I also am a fan of the Ultimate Tournament Drag with its oil impregnated washers. With proper care and maintenance the Seagate will provide great action against fish within model weight range. Graphite composite material works well for anti corrosion and weight reduction, but doesn’t stand the test of long term durability. 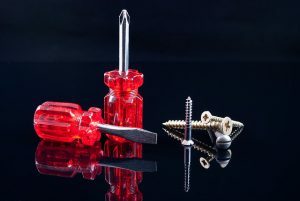 No matter how you put it, graphite won’t last as long as hard aluminum and will degrade over the course of many years. The centrifugal brake sacrifices distance for line control which can eventually become a hindrance. Once beginning casters turn intermediate they’ll long for free spool like the one in the Sealine X series. I also feel the 4 bearing system substantiates a very simple design. The casting features included make the Seagate a smart choice for beginning baitcasting anglers and will give more fishing than tangle time. The price makes the Seagate a great backup boat reel or rental rod addition and functions well as an all purpose workhorse. 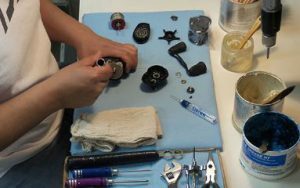 I always suggest that fishermen find a good local reel repair shop or individual. I feel better not having to ship my reels and it helps fellow anglers to give them business, as long as they do good work. 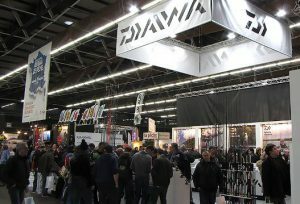 This might not be an option in all locations and Daiwa does provide a list of authorized service centers. Overall Ranking: 84 out of 100 people give their thumbs up. I’m satisfied with the build and the function of the Daiwa Seagate. Five different models gives a decent amount of range in target species and the reel will do the job it claims to do. I wouldn’t expect these reels to last a lifetime but for the price they provide top value and so make a good buy. Fell free to leave us your experienced thoughts as an pre existing owner or give some feedback if you decide to pick it up. 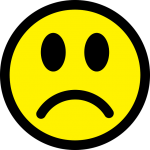 Signing off until next time, Geoff@FishtFight.com.